← Favorite Memory from 2014 – By Ilene B. One of my favorite memories from 2014 was Christmas because it was the first time Zach and I were able to share it with both of our families. This was also the first time our families have really been able to spend an extended amount of quality time with each other and that was very special to me. We have family on opposite coasts, so we usually spend Thanksgiving with one family and Christmas with the other. This year, however, we managed to entice everyone to come to Colorado for Christmas. Our crew included parents, grandparents, siblings, aunts, uncles, cousins, and our niece and nephew (the cutest of the bunch). In all, 22 people gathered together to celebrate Christmas and the bonds of family. Before everyone arrived, I spent a few days in the kitchen preparing food for Christmas Eve, Christmas Brunch, and Christmas Dinner (including 10 pounds of mashed potatoes alone). It’s a little ironic because I can go out and pound my residual limb by running with no problems, but standing in a kitchen for long periods of time or visiting a museum tends to make my leg really sore. Despite this, it was all worth it because the food was delicious and our families got to spend time getting to know each other instead of cooking. Two days after Christmas, we also went down to Colorado Springs to hike at Garden of the Gods. It was an amazingly clear and beautiful day, and a great way to wrap-up a wonderful time with family in our beloved state of Colorado. 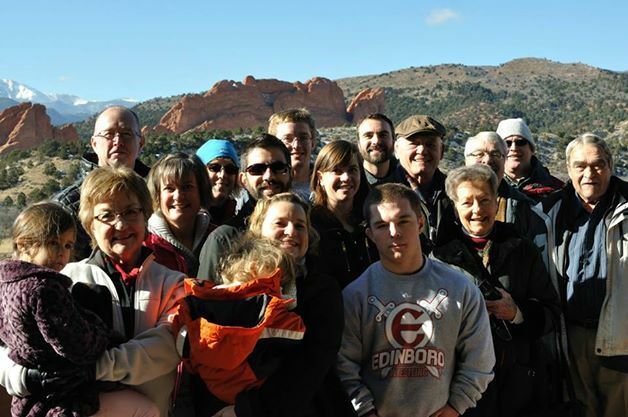 Most of the family who spent Christmas with us, minus the 5 who were already out hiking. This entry was posted in blog posts and tagged active life, active lifestyle, amputation, amputee, disabilities, disability, disabled, family, limb loss, memories, prosthesis. Bookmark the permalink.